(L to R): Suffolk County Legislator Kara Hahn, Suffolk County Executive Steve Bellone. Patchogue, NY - October 31, 2017 - On Sunday, over 1,700 runners representing 22 states, four countries and Suffolk County’s Legislature, sprinted to Patchogue to take part in the third annual Catholic Health Services’ Suffolk County Marathon. 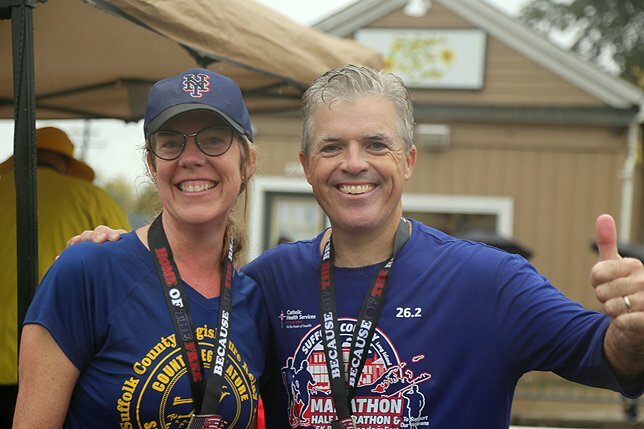 Fifth District Legislator Kara Hahn who had been part of a Suffolk County Legislature relay team during a previous marathon, this year ran the full 26.2 mile course that began and ended in Patchogue village and traversed several of Suffolk’s south shore downtowns. “Despite the weather, today was an incredibly bright day as I not only achieved my personal goal of completing every step of this marathon, but did so knowing that my participation will help Suffolk County’s veteran population,” said Legislator Hahn. According to marathon organizers, all proceeds from the event are donated to County based veteran assistance and service organizations. Since its inception in 2015, the Suffolk County Marathon and FreedomFest: Taste of Long Island Festival has raised more than $300,000 to support local veteran services. Subject: LongIsland.com - Your Name sent you Article details of "Suffolk Legislator Kara Hahn Puts Best Foot Forward for 26.2 Miles During Suffolk County Marathon"